DATE & TIME: Wednesday, March 9, 2016; Doors will tentatively open at 4:00 PM. Event begins at 7:00PM. EVENT DETAILS: Please limit personal items in order to expedite the screening process. All attendees must register in advance through Donald Trump’s website and present their ticket at the door in order to gain admission to the Crown Coliseum for the event. Upon entering the complex, please follow the direction of Fayetteville City Police for parking. Attendees will only be admitted through the north coliseum entrance regardless of where they are parked. Please download the PDF attached to this release for a visual of the pedestrian parking map. DATE & TIME: Wednesday, March 9, 2016; Doors will open at 2:00 PM. Event begins at 5:00 PM. EVENT DETAILS: Please limit personal items in order to expedite the screening process. All attendees must register in advance through Donald Trump’s website and present their ticket at the door in order to gain admission to the Crown Arena for the event. 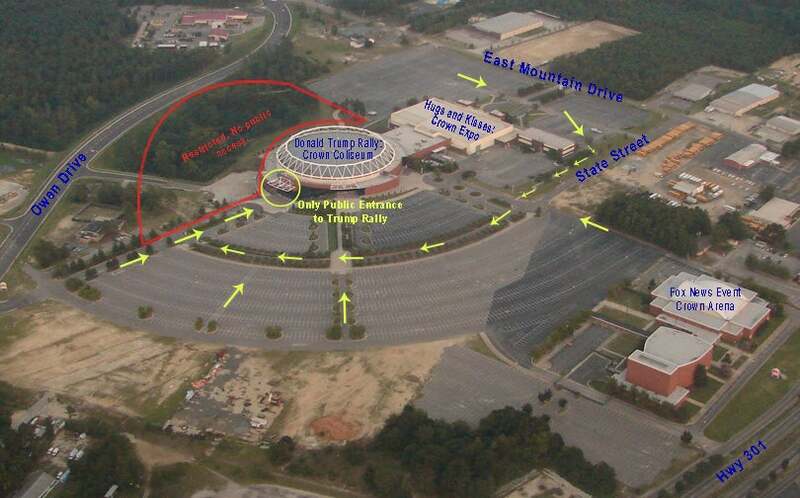 Upon entering the complex, please follow the direction of Fayetteville City Police for parking. Attendees will only be admitted through the main Arena entrance regardless of where they are parked. Registration/ticket(s) to the event does NOT guarantee entry. Entrance into the event is first come, first serve. In order to accommodate a smooth and efficient arrival, entrants should allow themselves ample amount of travel time. We anticipate heavy traffic congestion during the afternoon and evening on campus and in the surrounding area. Please pay close attention to road signage, police officers, and parking attendants. TRAFFIC PLAN: Due to the large volume of patrons expected for the event, the following traffic and security plan will be implemented. Traffic exiting on to Owen Drive will be directed toward either Business 95/Highway 301 or NC Highway 87. Signage will be used to direct traffic back into Fayetteville. There are NO U-Turns allowed on this road. Traffic directed on to East Mountain Drive will be allowed to continue to West Mountain Drive or turn Southbound onto Business 95/Highway 301. No traffic will be allowed to turn Northbound onto Business 95/Highway 301 from East Mountain Drive.